The bird above was one of a pair (the second much plainer), both fairly large birds with longish tails but seen only at this considerable distance. The photograph was taken on May 13, 2005, at 6:07 pm -- not long before sunset at this location across the San Pedro River from the Cascabel Clayworks (near the Teran Wash confluence). The bird perched for only a few moments before flying away, so we were lucky to get this photographic detail in a closeup view. We used a Sony F-828 digital camera, but apparently did not have time to zoom it in, since we have only one image and this is our best view at top magnification using Photoshop. At all levels of magnification, it is evident that the bird's tail is very long (which we had observed while it was flying), with some dark bars across it. (This rules out a Greater Kiskadee, which the Audubon Society expert we consulted called it, apparently discounting the definite tail structure.) Various Saguaro Juniper members consulted Mexican bird books, etc., without finding a good identification. Some have suggested an Elegant Trogon, and the size, shape and color-patterning of the bird approximate this designation, except for the bright yellow of the breast (and of course both the location and the season seem inappropriate). The pre-sunset illumination may have affected the color imagery, but it would seem unlikely to have altered that nearly so much as to generate this degree of yellowness. 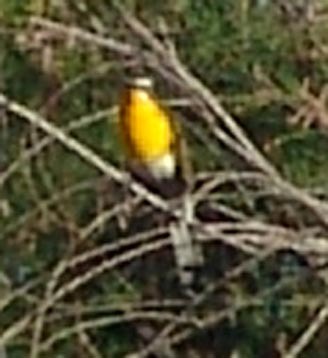 Others suggest a Yellow-breasted Chat, but we think this is much too small a bird, and the tail pattern doesn't fit. So this remains for us very much a Mystery Bird, not sighted by anyone else to our knowledge in this vicinity. Representatives of the Bird Oasis located nearby have said that none of their birds (exotics from various parts of the world) have escaped at any time. One lesson would seem to be to take very careful notes at the time of observation, when details now unrecoverable might have been registered.